Broken Spoke Bike Co-op | Women & bicycles – celebrating sisters of the revolution! 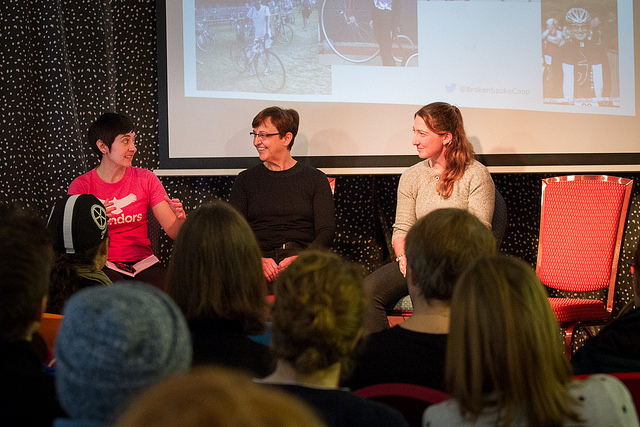 On Saturday 5th March, over 100 people gathered at the Broken Spoke to celebrate the growing role of women in the bike scene from racing and adventurous expeditions to mechanics and everything in between. Team Beryl volunteer Kat Young, one of the event organisers, tells us all about it. 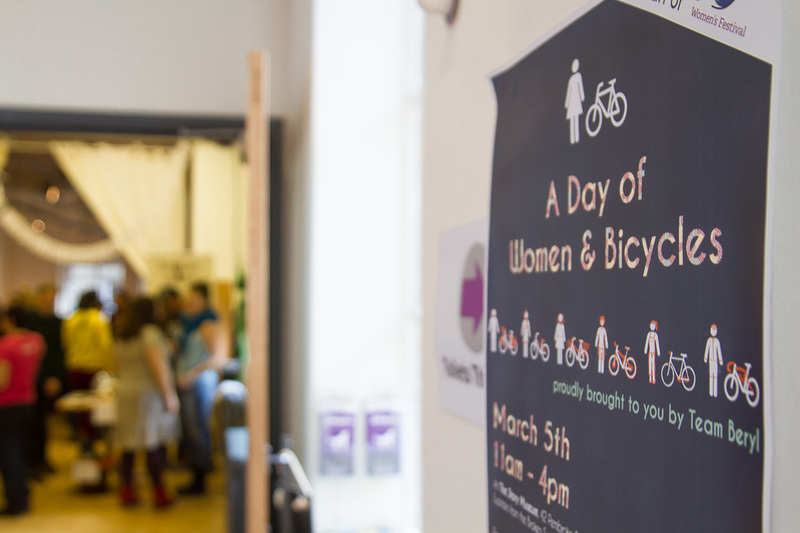 Women & Bicycles was sold out a few days beforehand, but it wasn’t until I walked into the packed-out space and felt the buzz in the air that I realised quite what we’d created. This was more than a gathering of women gushing over how much we all love bikes. It was a celebration of all the women making their way in the many different tributaries of the bike world, sharing experiences, hatching plans, and forging friendships. The day started with a panel on women in competitive cycling, a scene which has historically seen a dearth of women. We heard how Cheryl Reid, president of Cowley Road Condors, oversaw female membership in her club triple in the last year. Providing more opportunities for novice road riders, and getting women more visible on bikes, helped create a snowball effect. Cheryl also spoke of the value of support from her club mates: “Having club mates supporting you makes all the difference. It’s having people sharing the same passions and dreams as you”. Jan Philips, founder of the women-only Woodstock Classic road race, told us how cycling gave her strength, and called for more female coaches and race organisers. She approached the panel as an athlete who had transitioned from competitive cycling to coaching and organizing races. She still trains regularly – and intensely! – and agreed with Cheryl that one of the best ways to improve your game is to have a training buddy who challenges you. After a great comment from the audience about how not all cyclists will aim to be competitive, Jan chimed in (with Maxine’s complete agreement) that there is something about the physical intensity of training and competing that maybe some people just get a buzz from. Elite mountain biker Maxine Filby, who has only really cycled as an adult for the last 6 years, is earning enough points to compete at World Cups. She shared her experiences competing internationally, and the room for improvement in support of female athletes (gasps filled the room when Maxine spoke about being ignored and not allowed to borrow tools by a British Cycling rep after a crash, simply because she was not ‘in the team’). More positively, she revealed that although her motivation is internal, the support of her team, friends, and family, makes her get out there and keep riding. She spoke passionately about how anyone can get into racing, you just need to pick a goal and stick with it. Our morning guest speaker, Dr Sheila Hanlon, gave us a fascinating tour through 200 years of women’s bike design and cycling fashion (with some hilarious archive photos). We saw images of early bike design adapted (or, should we say, compromised?) to maintain contemporary ideas about women’s modesty, such as the ‘side-saddle’ high wheeler – the ‘Lady Ariel’ – a prototype which probably never worked. Ideas of appropriate dress and behaviour for women certainly resulted in some ingenious designs over the centuries from breathable bodices to drawstring skirts. Sheila shared with us how women’s cycling began to challenge and change their role in society with images of women (fed up of trying to cycle in dresses) wearing breeches or ‘rationals’ in the emerging cycling movement. This of course threatened a society concerned with gender order and masculinity; one woman wearing ‘rationals’ was reportedly assaulted with a meat cleaver, hoisted at her in passing (she was miraculously unharmed)! For more on Sheila’s research into the role of cycling in the women’s suffrage movement check out her website. The afternoon panel on women working with bikes, included BOTH of the UK’s only two female frame builders, Caren Hartley (Hartley Cycles) and Liz Colebrook (Beaumont Bicycle) (soon-to-be number 3 was in the audience – Caren’s apprentice Verity). 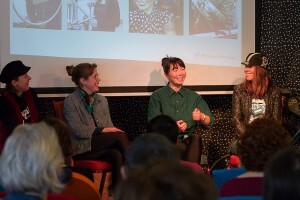 They were joined by two founders of community DIY bike workshops Jenni Gwiazdowski (of London Bike Kitchen) and Eleanor Smith (of our own Broken Spoke!). Eleanor shared the story of how Broken Spoke was born, and the trials and tribulations of balancing being a bike mechanic and teacher with running a business. Caren spoke of the support amongst women in the bike industry, who can all appreciate the struggles working in an environment traditionally dominated by men. Jenni told a story of this in action: when her bike was stolen and she couldn’t find another one to fit her body, she helped to fund Caren (who was then doing a very different type of metal work: jewellery-making) to go on a framebuilding course and make her dream bike frame… and the rest is history. Caren also shared the frustration of customers asking who does her brazing – as if gender affects ability to join metal! Movingly, Liz related a tale about being sent packing from her first ever trial shift in a bike workshop. After being told she didn’t have the aptitude for the work, she went to work in another bike shop for 13 years before operating her own shop and training as a framebuilder. So who’s laughing now? They discussed the barriers facing women wanting to get involved in the bike industry, and it was clear that societal pressure played a role. Whilst boys are encouraged to help their dads with a spanner and play on bikes, girls are often socialised to believe that some things – like mechanics – are off-limits. Liz reflected that, thanks to pioneers like those on the panel, it was getting easier for women to get into the bike industry, but there is still work to do to change attitudes. Now we may be biased, but we think community bike workshops are pretty great. Jenni and Elle talked of their role in enabling access to mechanical skills, and the independence this can bring. Both LBK and Broken Spoke have sessions for cis & trans women, WAG Night and Beryl’s Night, and these popular evenings prove (somewhat unsurprisingly) that women are really interested in mechanics! Quick plug: LBK needs a new classroom to expand their activities and help pay the rent, check out their crowdfunder. 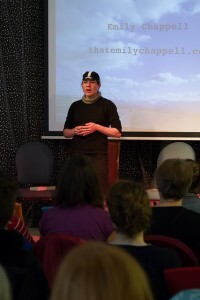 The day was rounded off by Emily Chappell, adventure cyclist and ex-London cycle courier, who left us spell-bound by her stories of cycling around the world, the people she met, and the challenges she faced. Having cycled through some very harsh conditions – including Alaska, Turkey and Iran in winter – she knows a thing or two about surviving in extreme conditions. Her take-home message was that the human connection and kindness is everywhere: she had experienced uncountable instances of hospitality and kindness on all her travels precisely because she was a woman. Of course, this is at odds with the popular notion that solo woman cyclists are in more danger than men. In fact, she said male cyclists she met often didn’t get the same hospitality being forced to kip in a tent in freezing temperatures when she had been welcomed into people’s homes. “So if a man you know plans to go long distance cycling you should probably warn them of the dangers, you know, ‘as a man’”, she said. We heard a wonderful extract of her book What Goes Around and were left on the rousing invitation to ‘go out and be bad at something’, just like Emily was doing by taking up mountain biking, or the women on the competitive cycling panel had done when they started out. Take a risk and be ‘ok’ with being rubbish at first. That’s how we’ll build the ranks of women in every aspect of the bike scene – commuters, couriers, elite racers, puncture fixers, mechanics, the lot! All that remains is a massive THANK YOU to all those that came, spoke, asked questions, ate cake, and spread the word! We would love to see you at our next Beryl’s Night, a session just for cis- and trans-women on the first Thursday of every month, 6pm-9pm, it’s FREE and there is cake. Connect with us on facebook to stay up to date with our awesome plans. 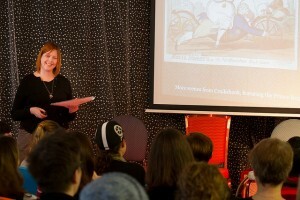 This event was part of the Oxford International Women’s Festival 2016.